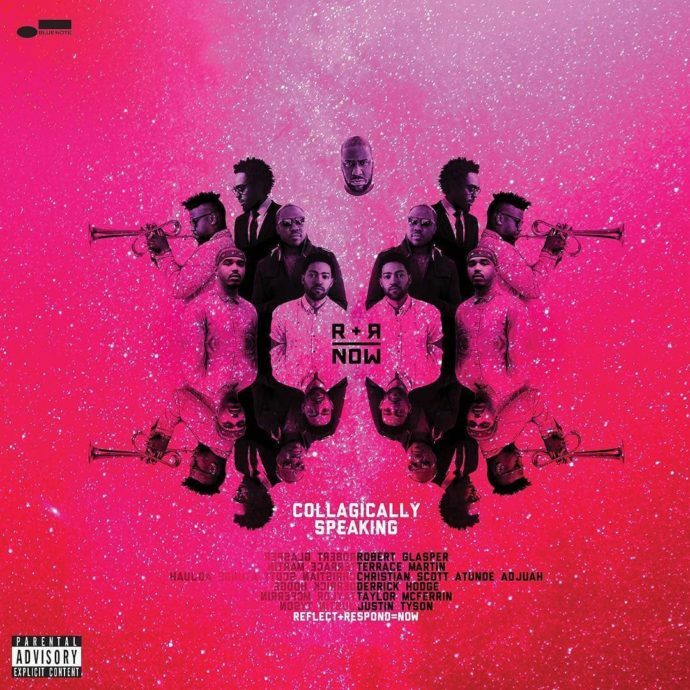 R+R=NOW, a supergroup featuring jazz pianist Robert Glasper, Christian Scott aTunde Adjuah on trumpet, Taylor McFerrin on synth and beatbox, Terrace Martin on synthesizer and vocoder, Derrick Hodge on bass, and Justin Tyson on drums. R+R stands for ‘Reflect’ and ‘Respond’, and is inspired from Nina Simone’s quote of it being “an artist’s duty… to reflect the times”. Collagically Speaking stylishly blurs the lines between contemporary jazz, neo-soul, R&B and instrumental hip hop in the span of 11 tracks. Each track was composed in the studio and recorded in a single take, encapsulating the magic of the moment. Guests on the album include the likes of Amber Navran, Terry Crews, Amanda Seales, Yasiin Bey and others. There’s a lot to digest when listening to this record. It’s both cinematic yet improvisational, slick yet dense. All 11 tracks feel extremely polished but vary in pace and style – providing texture and depth to the record as a whole. The album’s fantastic opener, “Change Of Tone”, is a perfect example of this. Terrace Martin leads the track with robotic vocoder-delivered lines over polyrhythmic break beats and classy fills by Tyson. Ghostly synthesizer lines echo the vocal melodies, merging with Glasper’s signature sprinkle of elegance and class with his piano chops. Just when the dust is about to settle, the track takes a turn into a drunken kilter, with Glasper’s impeccable improvisational skills taking the spotlight. Adjuah finally joins the fray in the final phase of the track, laying down minimal lines as the track winds down, bringing the seven-minute epic to a gentle close while simultaneously setting the stage for the next one. The mesmerizing qualities of the first trio of tracks greatly contrast the controlled chaos of “Resting Warrior”, which allow each member to show off their technical prowess in a pulse-pounding bebop-esque setting. Tricky chromatics, intricate licks and a scattered, primal beat intertwine playfully with each other in the track, forming a master class of situational improvisation as entailed by the slippery genre of jazz. Like any great band, each member allows space for the other to shine, and both understands and respects their boundaries. At the end of the day, it’s a simple equation, really. Put musicians of this calibre into a studio, and you’re going to get something magical and unparalleled by the end of the session. Author at Reverb Australia and Mixdown Magazine. Based in Melbourne, Australia.